I showed a lot of houses today, with a big mixture of front doors. Some gleamed and just about shouted “C’mon in!”. Others left us apprehensive about what the rest of the house would look like. So that’s this week’s tip – paint your front door! Maybe even get a new one, if the old one is beyond salvage. Need some guidance? Get a step-by-step guide here. Have trouble thinking of something other than white? Check out House Beautiful‘s suggestions. Here are a few more ideas for colors and palettes for your house. Then, once you strip it, sand it, prime it and paint it, it’s time to jazz it up a little! A kickplate makes a lot of sense – after all, how else do you open the door when your hands are full but with your foot? Kickplates add pizzazz and a touch of elegance, while being practical. They come in a wide variety of colors, finishes and sizes. How do you know what kind to choose? Look here for some guidelines. Okay, now let’s add something practical – a peephole. But not just any old peephole – you need a DoorScope! I showed a house a couple of years ago and was blown away by how clear and easily you could see everything outside your door. It’s a wide-angle viewer and you can stand back 5 or 6′ from the door and still see everything that’s going on outside. It looks a little like a small color TV on your door. Best of all, they aren’t very expensive. One last thing to consider – instead of the traditional door knob, you might think about a keyless lock. A buyer I worked with recently had a lock like this on his front door and he says it’s wonderful. He never worries about locking himself out. I want one that has a remote, like my car, and was amazed when I found one. However, it’s just one more thing to lose, so I think I’ll stick with something like this. This entry was posted in Things To Do Now and tagged 52 things, front door, keyless lock, kickplate, remodel. Bookmark the permalink. While I think curb appeal and a nice door really add a lot to a house, I don't know that I would put that on the top of my list of things to go out and buy unless the door was in really bad shape, Storm doors or screen doors are another matter. If those are in bad shape, I say, get rid of them or replace them. The keypad combos on front doors are nice and high tech but, like combination lock boxes, the combination is easily remembered and can present a theft risk. After all, it is hoped that lots and lots of people will be visiting the Seller's home. Which one of them will remember the combination and come back later for the flat screen TV or jewelry? The larger point of having a nice and welcoming entry point to the house is spot on! While I agree that I wouldn't necessarily put on a new door to sell the house, the idea here is to do things that you'll enjoy while you live in the house, that will also help when you go to sell. 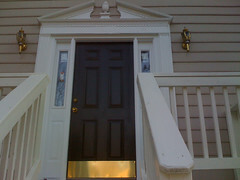 For me, a new or freshly painted door would make me smile every time I walk up to the house. A new roof did that for me for over a month. I would get out of the car and just gaze at the roof and smile. It was such an improvement over the old one! Thanks for your comment – I will write a very short opening paragraph to highlight the fact these are ideas for things to do now with selling maybe a few years out. Why can't you read what I intended and not just what I wrote?